John Baptiste Richard Sr. constructed the lower Platte Bridge on the Oregon Trail, 6 miles east of old Fort Caspar, in time to serve the heavy emigrant traffic in 1853. Richard Sr. was an early prominent trader on the North Platte River. In addition to running the bridge he operated a trading establishment that included a grocery and dry goods store and a blacksmith shop until 1865. "Richard's associates and employees were almost all married to women from various Sioux bands"; consequently, their Indian trade was mostly with the Sioux, and undoubtedly some trade occurred with the Northern Cheyenne and Arapaho as well. Albert Brubaker was in the small train led by Mr. Millard on their way to rendezvous with a larger train at the Bridger Cutoff. They reached "Reshaw's [Richard's] bridge in the latter part of May 1864, and then we met a band of some 800 Indians, consisting of tribes of Arapaho, Sioux, and Cheyenne. They were holding a council at that place." In June of 1859 a French Canadian by the name of Louis Guinard completed a second bridge--the upper Platte Bridge--on the North Platte River at the site of historic Fort Caspar. Guinard constructed a stage station near the bridge and tapped the early stage traffic along the trail. Guinard was married to a Shoshoni woman; therefore, his trade was mostly with that tribe. His post at the time was located at the extreme eastern edge of Shoshoni territory, and Richard's post, located 6 miles downstream, was the western edge of the Sioux territory, as roughly established by the Fort Laramie Treaty of 1851. Suffice to say that each proprietor's Native American clientele was distinct. Richard purchased Guinard's operation sometime in 1864. During the spring of 1864, the Richard bridge was the point of assembly and departure for the few wagon trains that used the Bozeman Trail. The Guinard bridge served the same role for the trains that took the Bridger Trail to Montana. For example, when William Atchison's train reached the Lower Platte Bridge, there was considerable debate among members about whether to take the Bozeman Trail or the Bridger Trail. On June 20, Atchison "Drove 10 miles to `Lower Platte Bridge' where Bozeman's cutoff takes in. Had quite a discussion whether this or the `Bridger' cutoff should be taken. 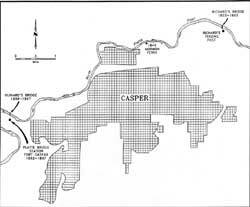 The Bridger men prevailed and we drove 5 miles further to 'Upper Platte Bridge' and camped. . . ." Baker did not mention this discussion, but he did mention that the Bozeman Trail began opposite the lower bridge. 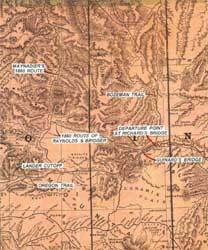 Ethel Maynard, however, remembered that "It was easily decided to try the new shorter route" - the Bridger Trail. On June 21, Atchison "Drove to . . . `Red Buttes'. . . . Here a train of 100 or more wagons was formed for the mutual protection in taking `Bridger's' cutoff. We employed, as a guide, `Rocky Mountain Bob' paying him for his services $300." A new route from the North Platte was established in 1865 by Connor's column. That same year at the upper bridge (Guinard's bridge), the Platte Bridge Station was expanded following the death of Lt. Caspar Collins in the Platte Bridge Fight and was renamed Fort Caspar. In the fall, the soldiers at the new post needed building material for huts and needed fuel for their fires. To save time and labor, they went down to Richard's bridge, disassembled it, and hauled it to Fort Caspar to supply this need.